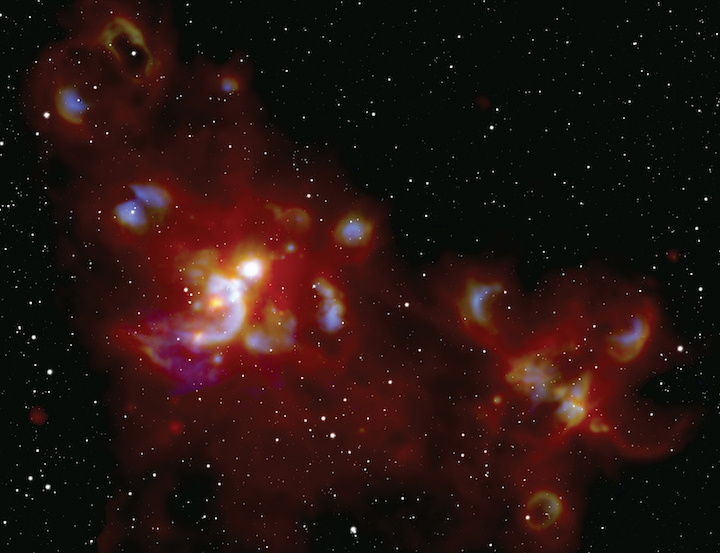 A cosmic light show sparked by the formation of massive stars in the stellar nursery, called W51, glows over on a star field image (white) from the Sloan Digital Sky Survey. The oldest and most evolved massive star is in the upper left of the image, shown at the middle of yellowish bubble. The youngest generations are typically found in areas near the center of this figure, near the brightest ball at the slight left from the middle. Massive stars like these emit so much energy that they play a critical role in the evolution of our galaxy. When massive stars — many times larger than our Sun— are born, they shine hot and bright before eventually exploding as supernovas. They release so much energy that they can affect the evolution of galaxies. But, unlike stars like our Sun, astronomers know much less about how these enormous stars form.